I do. I received a beautiful blank gardening journal several years ago as a housewarming gift. By now, it is well worn and coffee stained – and filled with little details about my beloved daylilies, hostas, and future plans. In short, it is filled with the subtle details I would never recall if left to memory alone. I love revisiting it again every winter as I look forward to the day when I can get back outside and dig. I love adding new notes to it as each new gardening season unfolds. It seems I’m not alone in my garden journal love affair… Many gardening books and experts highly recommend keeping a garden journal. Although many gardeners like the idea, there can be some confusion surrounding what to record. 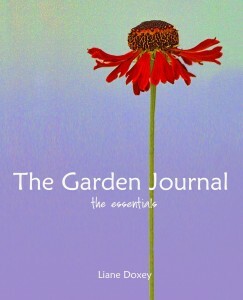 The Garden Journal: The Essentials by Liane Doxey, has taken out all the guess work. (You may have seen this particular garden journal featured in Midwest Living Magazine). It is broken into sections covering key gardening topics to help you achieve the gardens of your dreams. Plants In Bloom – record your plants bloom cycles. Starting from Seed – track each seeds progress from germination to bloom. Purchases – when and what you purchased and from whom. Planning Diagrams – record what you have planted and develop the garden of your dreams. Guides – staking and dividing your plants. Reference Sections – your favorite things, annuals you love (or not), container plantings and more. Whether you are a gardening novice or a master gardener, this journal will become a trusted resource to record your garden plans, challenges and triumphs. Finally, a real guide to what you will want to remember from one growing season to the next!